Mimosa: Mimosa Cabernet Sauvignon �The Mimosa Cabernet Sauvignon is handcrafted by award winning Swiss chef, Bernhard Hess and boutique winemaker, Lourens van der Westhuizen. On the foothills of the majestic Langeberg Mountains of the gateway to the arid Karoo, they create a fitting tribute to the Mimosa Collection. Complexity meets balance to create a full-bodied wine with strong plum aromas, soft tannins, a lingering finish and the flexibility to enjoy immediately or age up to 8 years. 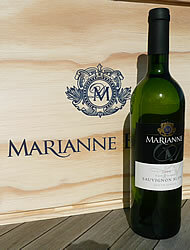 https://www.weinbaule.de/red-wine-south-africa-mimosa-cabernet-sauvignon-p-1893.html?osCsid=eb7a4ef626671d89ee1bff2d172a3797"> Wine 13.49 6009808940062 WeinBaule.de | The Home of Wine Mimosa New In stock!